June | 2014 | Can Men Cook? We had visited the refurbished Salutation Inn a couple of months ago. It was mad busy, and there was a big wedding on. 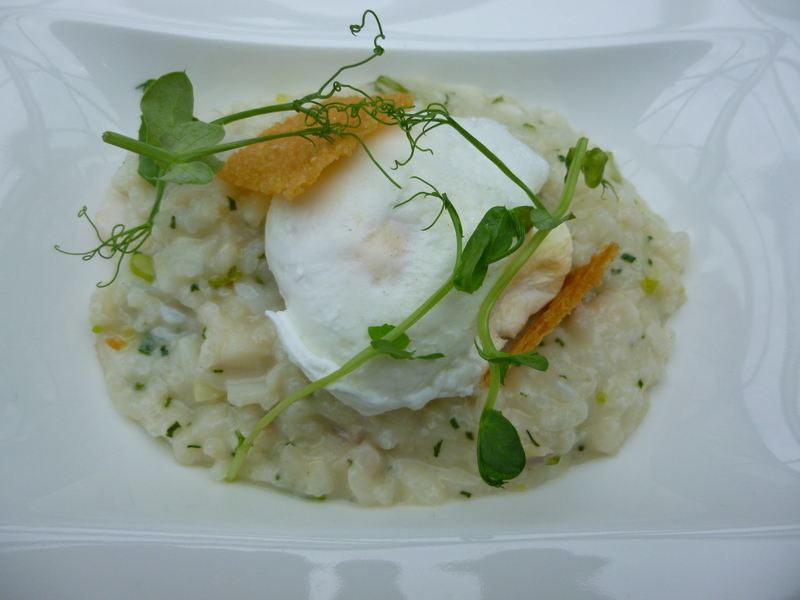 I had my favoured River Exe mussels, and Jane had her favourite risotto. It had all arrived slowly and not all my mussels had opened. 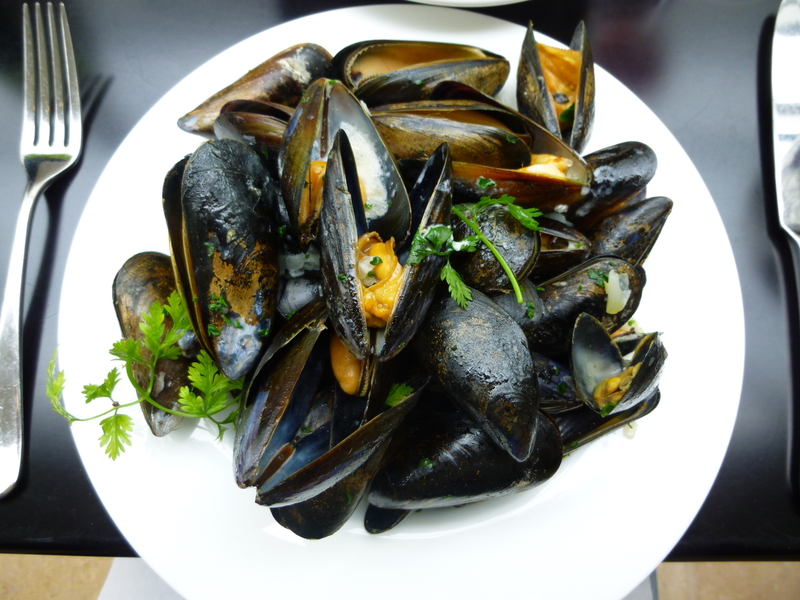 The staff handled it beautifully – removing the cost of the mussels from the bill without telling me. It seemed such a great place and we loved the new courtyard setting – all glazed – ultra modern against the 16th century building. So we went back. It is a bit like you always panic when you recommend a place – just incase someone doesn’t turn in for service, or a supplier doesnt supply, or chef is not on that day or whatever. We had heard so many great things about The Salutation Inn (click for their web site) that we returned for my birthday lunch. And – some would say madly – ordered the same light lunch. Don’t need to say much else. Ambiance – lovely – staff – attentive, smiley, and want to do the job right; wine – available by glass and 500 ml carafe – brilliant in betweeny size. (And bottles of course…). We have returned – and will again. The reports are not wrong. 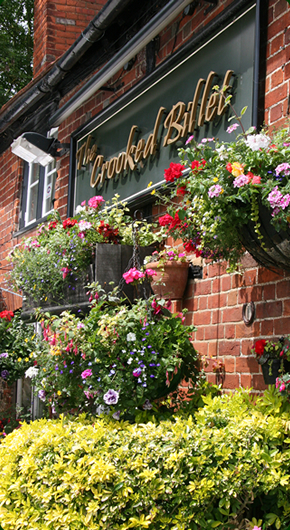 It is an excellent spot, with very special food. The afternoon teas looked heavenly! 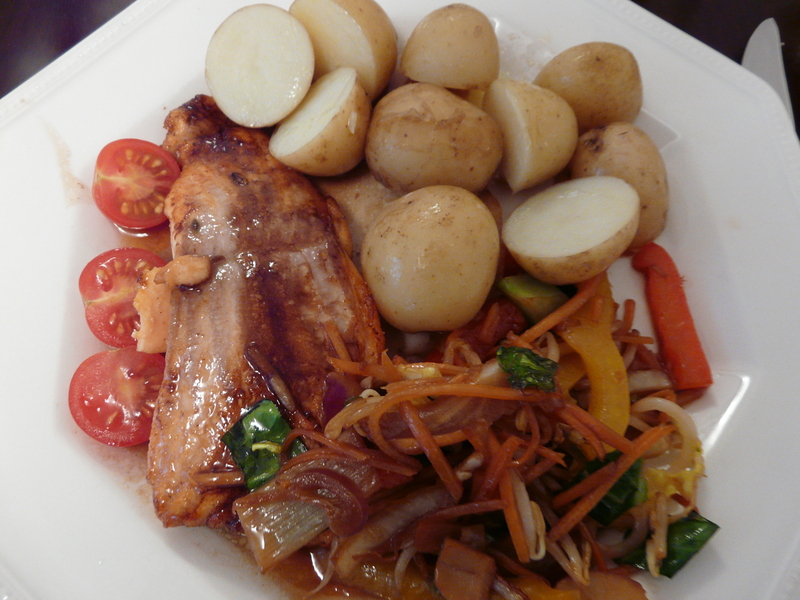 Pan steamed Salmon – another simple pleasure! How often does that happen in the mid week in your house? Well, we remembered having bought 6 salmon fillets but only used 4 of them, so had two left in the freezer. Not much shopping to do then! It really was simple. Boiled a whole gang of new potatoes – which always feels like summer to me. While they were on the go, and not too soon (after 15 mins to be precise) I started the salmon of in a small frying pan, in some groundnut oil and butter mixed. I added some extra flavour by putting a few (A large pinch) of fennel seed into the oils. About 4 minutes, then it’s the turn over time – always tricky with fish – you don’t want it to fall apart! A coupe of scorched fingers later, and we are done. I love the way salmon tells you when it is nearly cooked. The raw look changes colour on the side of the steak until it is uniform. Isn’t nature wonderful? At this stage I add a dessert spoon of lemon juice, and squirt some honey on the fish alongside a squirt of balsamic glaze. Then the pan is covered (tight fitting lid is needed) and heat turned down. Drained the cooked spuds, added a pat of butter and left them covered to soak up the flavour. The stir fry mix (we did have to go out for that!) added crunch, colour and yet another flavour – a bit of soy sauce at the end. 20 minutes from cooker on to table. Hardly time for a G&T! Keep it simple is never a bad rule in the kitchen. And this was scrummy! I was eating alone tonight – Janie out – so resisted the temptation of a ready meal for one. 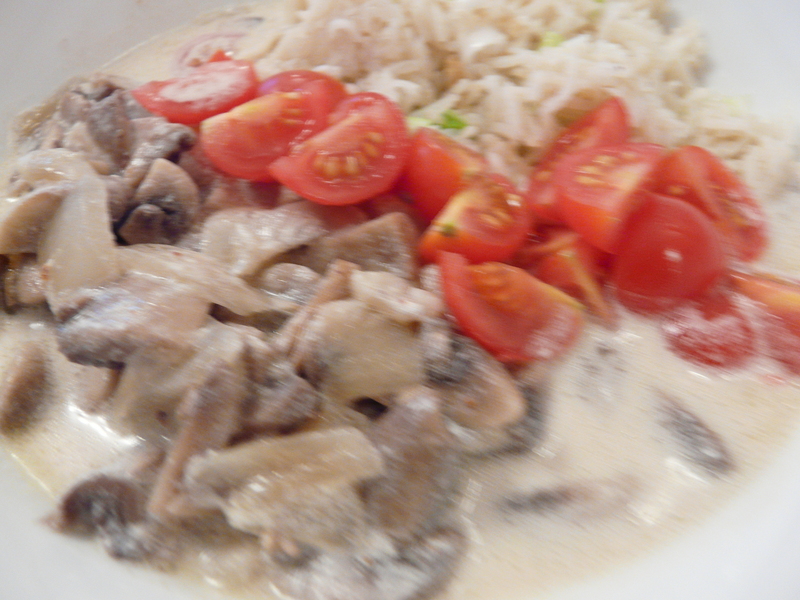 We had loads of mushrooms in – so, one of my few ‘veggie’ evenings began! Wash and chop your mushrooms – I used 7 medium sized ones for me, and add them to the frying pan – swirl them around a bit. I stirred two chopped spring onions into the rice after it cooked – just for colour, taste – and one of my five a day!